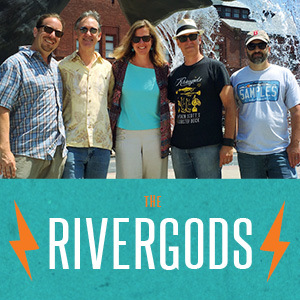 2011 is shaping up to be a great year for the Rivergods (already! )…We’ll be putting the finishing touches on our forthcoming studio album ‘Signs’ in January, which will feature ten new songs from the band. The record is being produced with Eddie Shea (who works/has worked on the road some big talent including Joe Cocker and Brian Wilson… !) and will feature a couple of special guests. We’re looking at a Feb./early March release date, and it’s sounding smokin’ so far… just wait ’til you hear the title track! BUT even before that we’ll be kicking off the year with a brand new single “Big C” to be released January 29 on New London’s own Cosmodemonic Telegraph records. Cosmodemonic is releasing their annual batch of Hygienic singles from New London-area artists, and as a theme this year, the b-sides of the singles will feature New London artists covering other New London artists, past and present. “Big C” was recorded for (and will appear on) ‘Signs’, but this “single only” version will feature a special guest appearance by local jazz/rap/fusion band Above/Below‘s MC Gabe Chandler, in a pretty-damn cool crossover performance with the ‘gods. And the B-side? Well, let’s just say it’s a pretty heart-pounding, Doors-esque version of a song by an old New London band called … let’s just leave it a surprise, shall we? A video for ‘Big C’ is also on the way, directed by New London area producer Andrew Bell. Rivergods’ singer Ben Parent will also have his first solo single out as part of the Cosmo collection, a brand new song called ‘Empire’ AND Rivergods’ (other) singer Nancy Parent will have a single out with her vocal band the Red Hot Stove Tops. AND word on the street is that another New London-based band, Bedroom Rehab Corporation, is covering the Rivergods’ song ‘The Point’. All in January, to be released Hygienic weekend 1/29/11…. Can ya say ‘WOW’?! Whew…. Now, check out the upcoming SHOWS! This Circle goes to 11! the Rivergods’ annual Holiday Show January 1st!